This project primarily consists of four units: Microchip Technology’s SST89E54RDA-40-C-PIE, a sensor unit, an ADC0804 ADC component and the LCD module. Along with detecting an obstacle, its exact distance is also calculated and displayed on a 16×2 LCD interfaced to the microcontroller. The IR receiver detects the IR radiations reflected by the object being measured. The output voltage level of this IR sensor depends upon the intensity of IR rays received by the receiver. The intensity, in turn, depends on the distance between the sensor module and the obstacle. When the distance between IR pair and obstacle is lesser, more IR radiations fall on the receiver, and vice versa. The receiver along with a resistor forms a voltage divider whose output is supplied as the input for ADC0804. 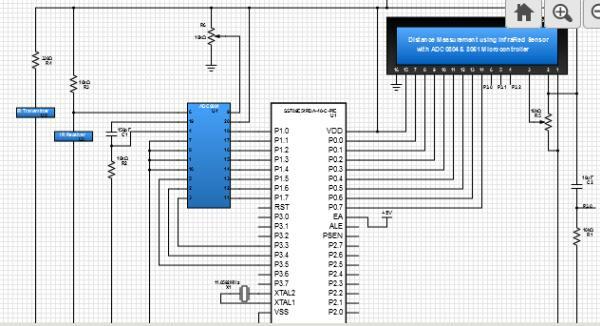 The calculation of the distance is achieved by processing the output of IR sensor through an ADC0804 analog to digital converter. It is calibrated to get accurate distance measurement. During power-on reset, the SST89E54RDA-40-C-PIE can be configured as either a slave to an external host for source code storage or a master to an external host for an in-application programming (IAP) operation. The microcontroller is designed to be programmed in-system and in application on the printed circuit board for maximum flexibility.